Some of the most memorable scenes in Skyward Sword for me are those when you have completed a dungeon and Fi graces you with a dance. She does this as she conveys an ancient message from Hylia, accompanied by a moving rendition of “Ballad of the Goddess”. Her fluid movements and graceful spins linger on my mind, even if I haven’t played the game for quite some time. In still art, it’s sometimes hard to convey movement properly, but in Louivi’s artwork, “Dancing Fi”, the fluency and emotion are clearly captured. Everything about this artwork is so well put together! 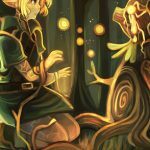 The piece looks like it is constantly in motion with Fi’s flowing, swirling arms, and there are beautiful transitions from the cool blues to warm reds and purples. It truly feels like she is dancing on the page! As I mentioned before, it can be very difficult to convey this on paper (or digital canvas), so I cannot praise it enough for accomplishing such a feat! Then there’s the emotion behind it. Though the art is minimalistic, you can see the pure joy on Fi’s face. You can see the happiness behind the way she moves. In the game, Fi is a very hard character to read, given her lack of empathy, but during these few moments where she delivers the words of her creator, a sense of wonder can be felt. It is so nice to see that moment perfectly captured in this art. Fi isn’t a character we see much emotion from in Skyward Sword, though that is the point. She grows and develops as a character, learning more and more about feeling and compassion. However, most fan art still conveys her as a blank slate, simply observing with a stoic look on her face. It is nice to see that there are some like Louivi who also see that bliss she feels when she performs for Link. 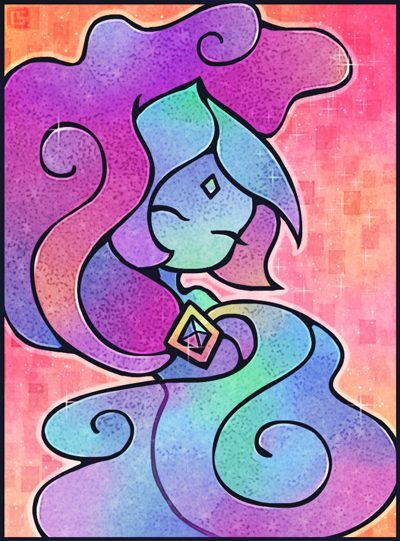 Fi is beautiful, and she is even more so when she is happy. Louivi, thank you for sharing this truly wonderful artwork!